Eastern Bank Ltd. and Diners Club International have collaborated with Vroom Services Limited, the first vehicle related service provider in Bangladesh where services are available through a dedicated contact center and mobile app. Vroom Services Limited provides service through a network of partner workshops and in-house service team 24x7, 365 days a year for the Vroom membership cardholders. 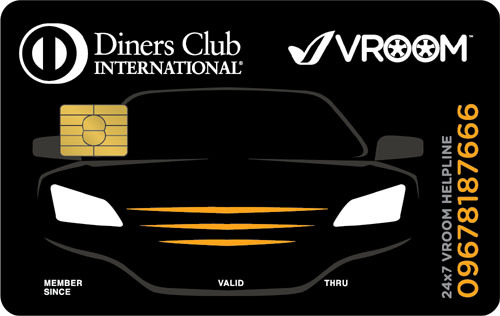 As long as you are a valid Vroom member, you do not have to pay any annual fee for your EBL Diners Club International Vroom Co-branded Credit Card. A supplementary card for your vehicle driver to meet day-to-day expenses at fuel stations. This card also helps you to keep track of the exact expenses made through the card. You can pay for your expenses at Vroom partner garages as well as more than 165 Partnered Merchants using this credit card and convert large expenditure of your vehicle into easy installments for up to 36 months. Shop more and save more at any Aarong outlet with your EBL Diners Club Vroom Co-branded Credit card by getting 10% discount on all your purchases. Live a better life with the privileges for health care from Diners Club International Card. As a Diners Club International card member you will be eligible for cash insurance benefits of BDT 1,000 per day on hospitalization for maximum 30 consecutive days. EBL has its own lounge service at Hazrat Shahjalal International Airport, Dhaka and Shah Amanat International Airport, Chittagong (Domestic Only). Just show your EBL Diners Club International Credit card at SKYLOUNGE and get complimentary usage facility 24x7. You can take a guest along with you. Moreover, children below 12 years of age get complimentary access too. With this card you can get access to over 600 exclusive VIP airport lounge locations around the world. To be admitted into these lounges, cardholders must present their Diners Club International card and cardholder can avail this facility at any participating airport lounge regardless of airline of travel or class of ticket. In case of Accidental Insurance Coverage, EBL Diners Club International Credit cardholders are automatically entitled for Accidental Insurance coverage of up to BDT 1,000,000. HiPO is an EMI plan where you can make EBL to EBL account transfer, other bank’s account transfer through EFTN or issue pay order from the unutilized balance of your credit card. Please CLICK HERE for Fuel Station List where EBL Diners Club Vroom Credit Cards are accepted.